The first annual TEDxUW-STOUT took place in October of 2015 in the Memorial Student Center at the University of Wisconsin-Stout. The preparation for the event was about a year long of coordination of volunteers, speakers and event promotion. This event gave light to the ideas of UW-Stout alumni and faculty. The founder of the first annual TEDxUW-STOUT event was none other than Mary McManus. As the head of Civic Engagement and Inclusivity at UW-Stout, Mary was able to take this event on with the support of the Involvement Center Staff and all of UW-Stout. Once the project was accepted, Mary reached out to me for help with the promotion, branding and website for TEDxUW-STOUT. The chosen theme of 2015 was "EDGE: Explore, Discover, Grow, Engage." The presenters were prompted to speak about ideas worth spreading and follow the EDGE theme. Using the branding for TEDx events, the website and branding system had to support three different stages of the process: 1) Speaking at the Event, 2) Attending the Event, and 3) Event Details. Over an 8-month planning period, the TEDx committee accomplished many tasks that we weren't sure were possible. 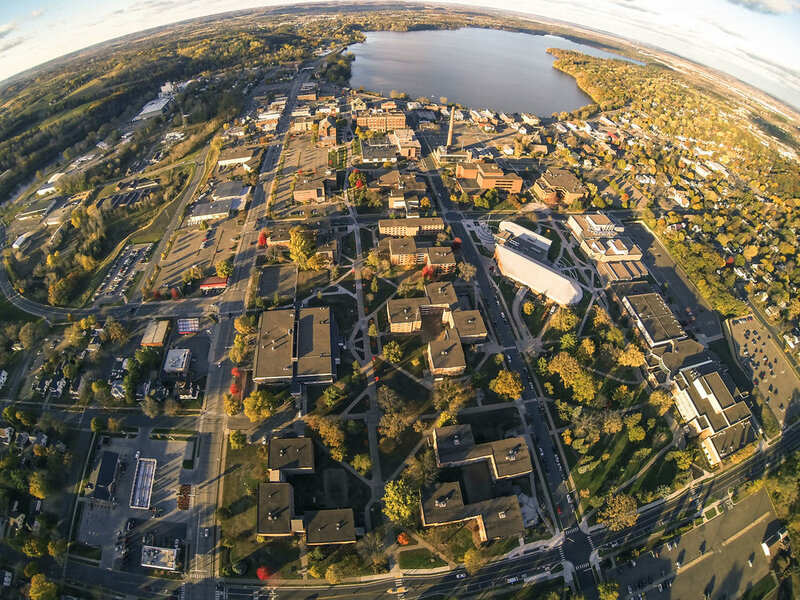 From narrowing down submissions to planning the day-of event, TEDxUW-STOUT came together with flying colors. It would not have been possible without the branding support of the Memorial Student Center Design Team, the TEDx committee members, and the tech crews. Various attendees mentioned that this event was the best "TEDx" event that they have ever attended. UW-Stout is a medium-sized public university with an average of 10,000 in attendance per year. It fits nicely in the heart of downtown Menomonie, WI. UW-Stout is a Polytechnic school; a career-focused undergraduate and graduate university that combines applied learning with a liberal arts education. The iconic clock tower is one of the main visuals of UW-Stout. The tower is the tallest point at campus and is used in branding across campus. The hands-on experience that UW-Stout provides leads to unique learning for all majors. The goal for classrooms is a 50/50 approach with 50% lecture and 50% hands-on. The TEDx event's logo should always include a red "TEDx" and either black or white text for the other words. The name of the event always aligns left in relation to the "TEDx" part of the logo, and is sized to be exactly the same height as the "TEDx" part of the logo. The typeface (Helvetica) is an integral part of our visual identity and should not be changed or substituted. If Helvetica is not available, it can be substituted with Arial. Letter-spacing in the TEDx logo is set to 0. Individual letters in location name can be kerned. When possible, a spot color should be used for the logo, this is the best way to reproduce TED red (Pantone 485). When your TEDx event's logo is reproduced onscreen in slide presentations, in video, or online for the web, RGB or web color logos should be used. Onscreen applications use RGB (red/green/blue) values to simulate color. On the web, hex values are used to specify color. Each of these specifications is shown above below. If specifying a spot color is not possible, the 4-color process (CMYK) method of printing may be used to print the TEDx logo. 4-color process printing is acceptable, although it is not the preferable way to reproduce the logo. In 4-color process printing the TED red color will only be simulated. Local settings and calibrations should be used to determine the best color specifications for your particular printer.